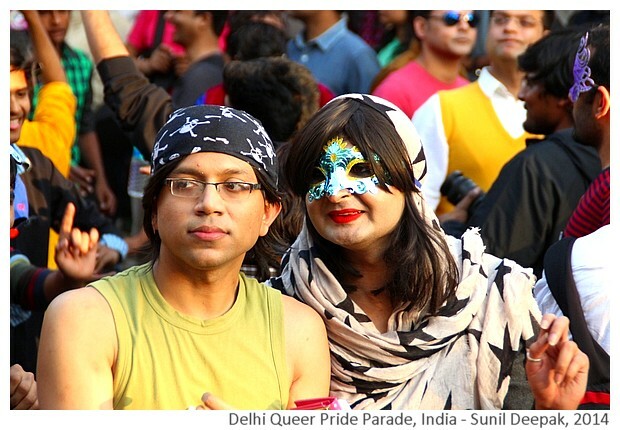 The last time I had participated in the Delhi Queer Pride parade, was in 2009. 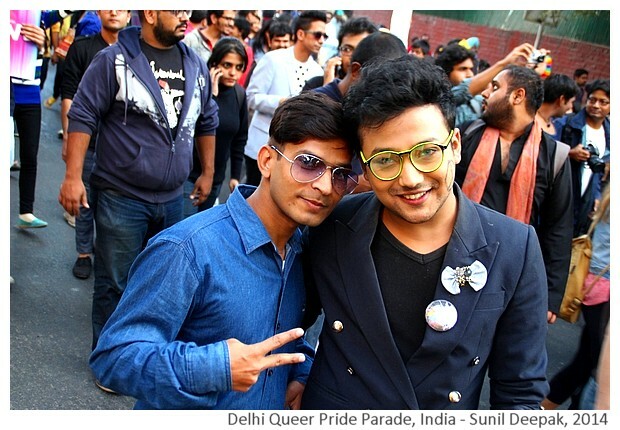 After 5 years, this time I was again there for the 2014 Pride event. 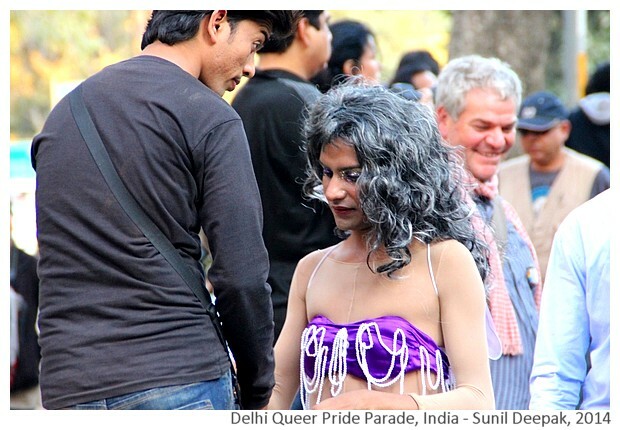 This photo-essay is about my sensations at the Pride parade, about what seems to have changed and what has not! Compared to 2009, this time the crowds were bigger, and more self-confident, joyful. However, I was hoping to see even bigger crowds - considering that Delhi has 16 million people, the crowd was still too small! 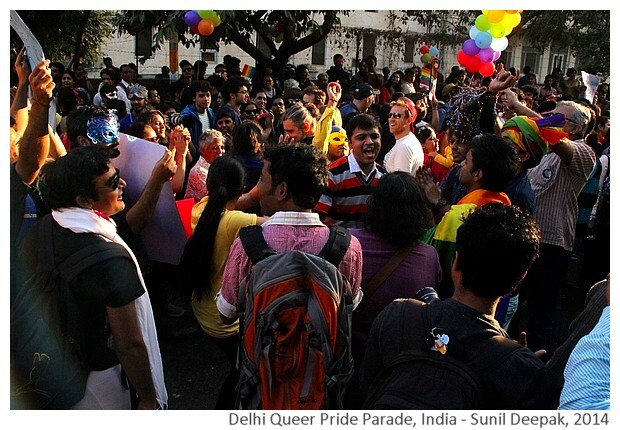 The Pride parade was lot of fun, full of dancing, music and colours. Though I was busy clicking pictures, even I could not stop my feet from tapping at the chanting rhythm of "Azaadi, azaadi, le ke rahenge azaadi" (Freedom, freedom, we shall get our freedom) of the group in the picture below. 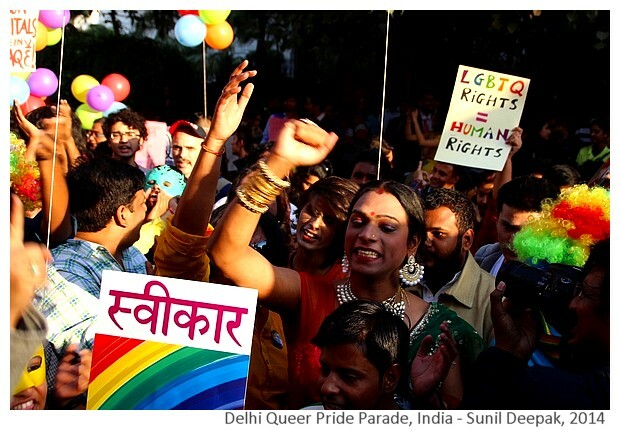 In 2009, it was only the second Pride parade in Delhi, many persons were subdued and some of the comments on the evening TV shows were tragically hilarious and ignorant. This time, I did not watch the TV to check if they were talking about the event and in which terms! 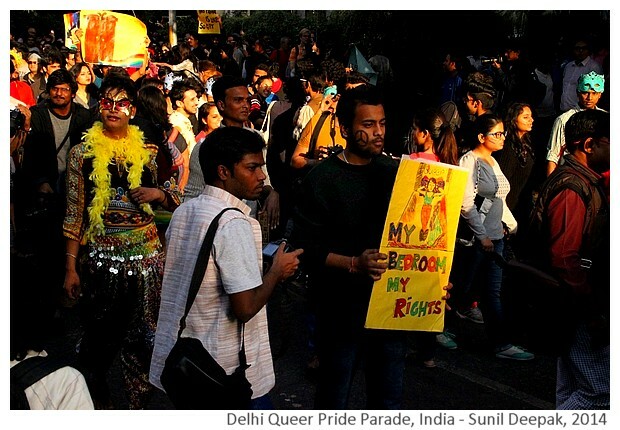 To see the young guys shouting "I am gay, that's ok" was also illuminating in understanding the meaning of participating the Pride for so many persons - to be able to say aloud in a public space what we think of as a shameful part of us, is extremely liberating and an important step in the building of the self-acceptance process. 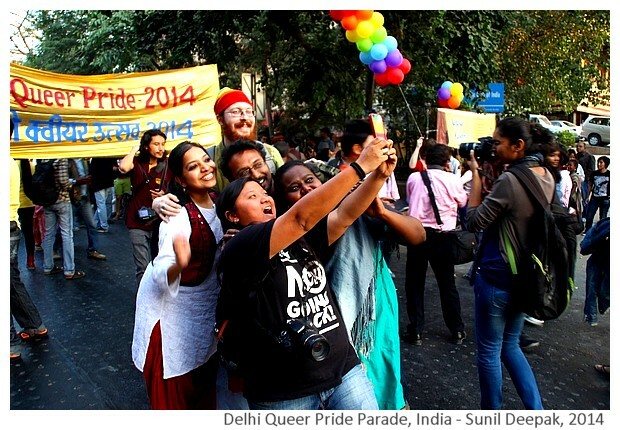 I think that along with changing public perceptions about queer persons, Pride parade is important in reaching out to persons feeling isolated and telling them that they are not alone. 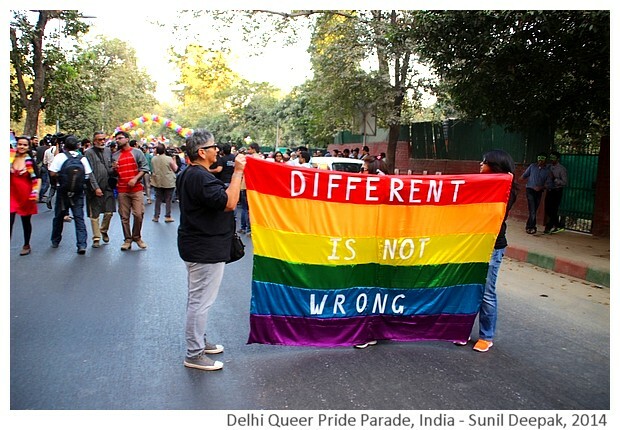 However, there were not many banners in the pride parade. I think that banners express solidarity of the institutions and show how deeply a movement is embedded in the society. I hope that one day there will be associations of parents of queer children, queer parents of children, queer lawyers, queer police and military persons, etc. 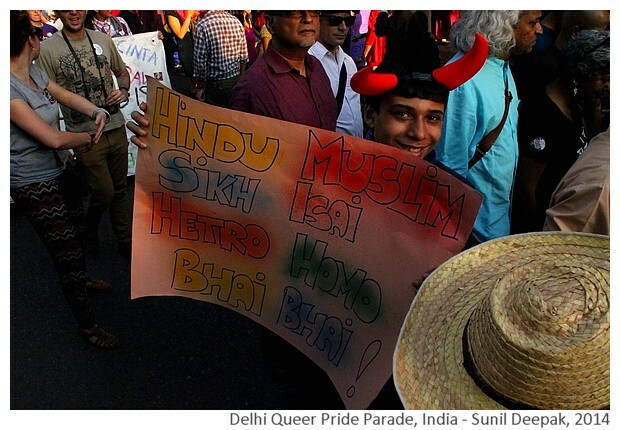 in India who will join the parade. 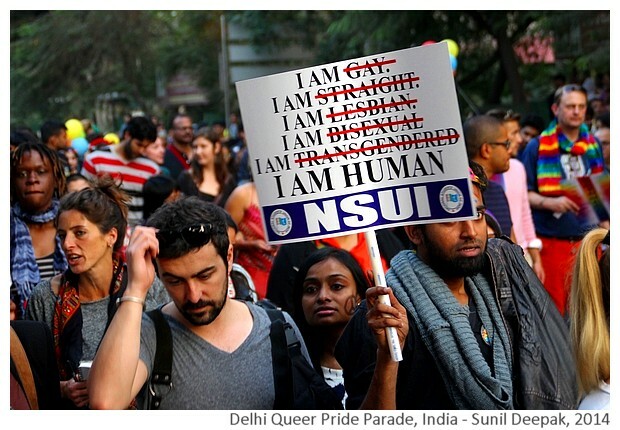 Among the institutions, National Students Union of India (NSUI) was there with placards focusing on the human rights dimension of the GLBTI struggles. I also hope that dalit organisations, women's organisations, disabled peoples' organisations, etc. 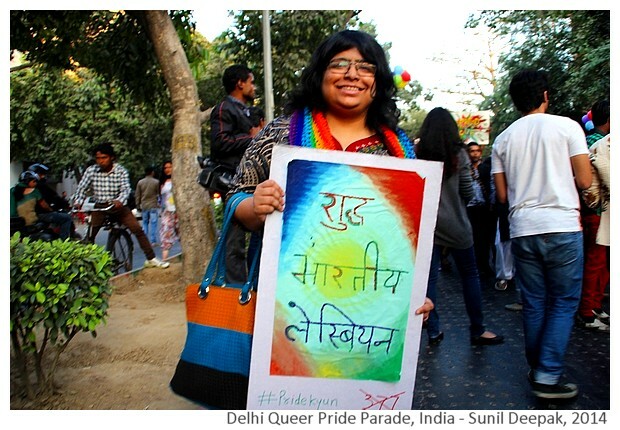 will also formally join Pride, because the fight for rights of GLBTI persons is part of the human rights struggle. 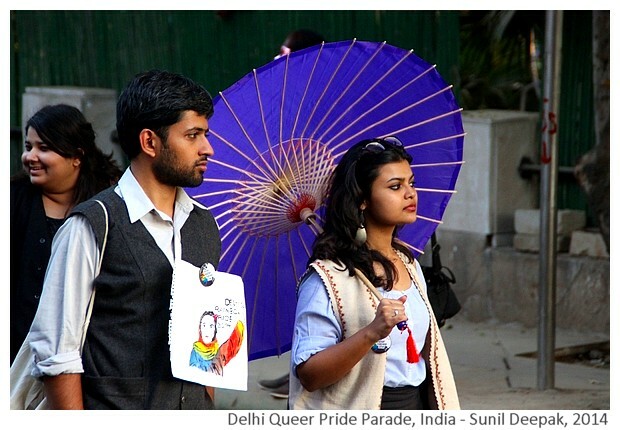 You can also check some more posters from the Pride parade on my photoblog. 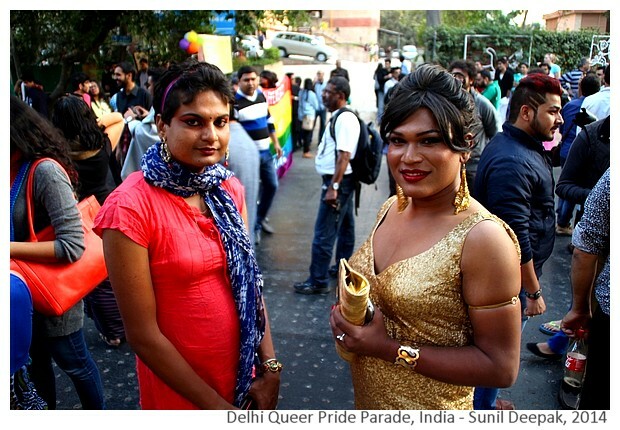 Many of my GLBTI friends tell me that focusing on fancy dresses, costumes and heavy make-up, is a way to stereotypes them because most of them are regular persons. However, dressed up and colourful persons make for better photo-ops! Here is a selection of some of them. 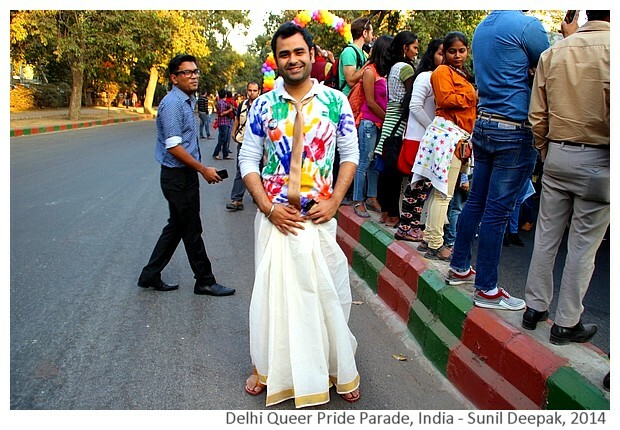 I think that the award for the best dressed person of the Pride 2014 should go to the guy in the picture below. He was gracious enough to pose for me, so I owe him thanks. 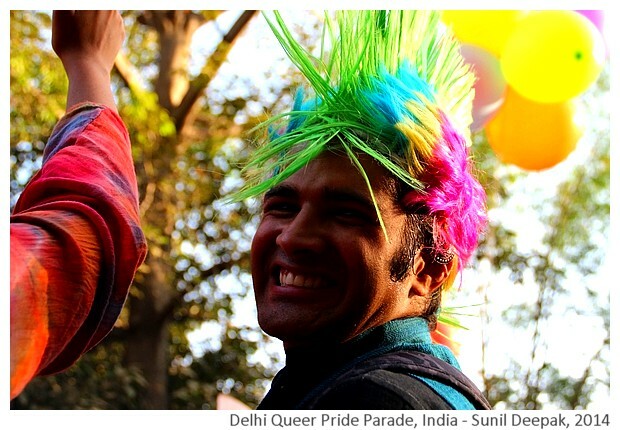 For a lot of persons at the Pride parade, it was time to have fun. Selfies were being clicked every where. Below are some of these fun moments. 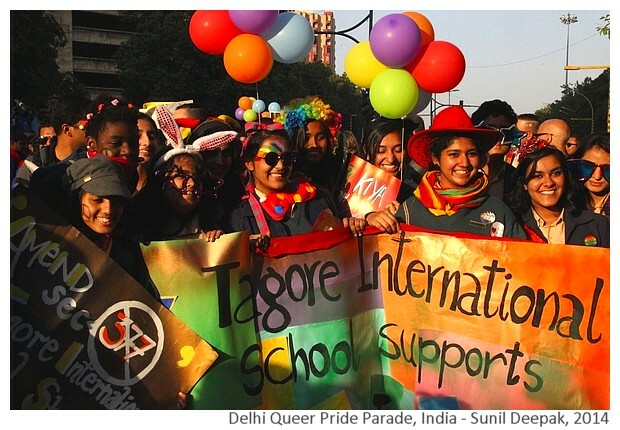 It was a pleasant surprize to see the students of Tagore International school with their banner in the Pride. There were some other very young persons in the parade as well. 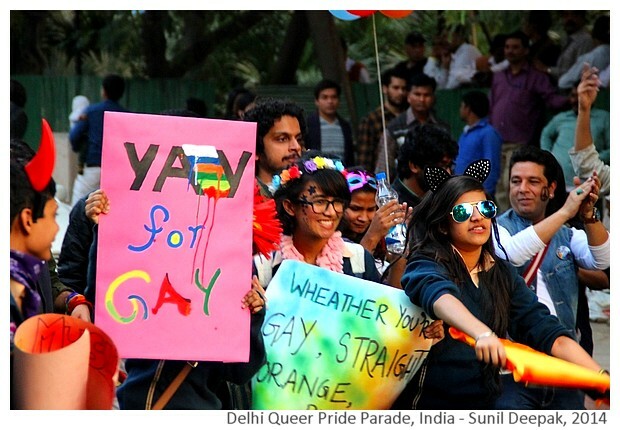 I hope that in future more schools can join Pride parades. GLB labels have also been important in raising up important issues about sexual orientations and their links to human rights. At one level, labels are comforting because they provide a security to our confusing emotions but they can also be limiting, trying to fit us in a category while the reality of our emotions and desires can be much more dynamic. 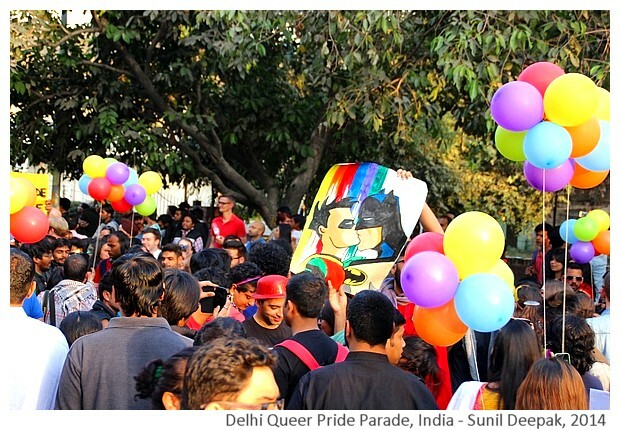 In that sense, I prefer the term "queer" compared to GLB, and I am glad that the Pride organisers have decided to call it Queer pride. I believe that some of the worst homophobes and persons who react violently to queers are those who are insecure about their own sexuality. One of the posters in the parade touched on this through a question, "How does my homosexual marriage threatens your straight marriage?" If we are secure in who we are, it is easier to accept everyone else! It was a good decision by the organisers to hold it in November rather than in June, as was done in 2009 - at that time, it was just too hot even for simply walking! The pride parade was a lot of fun. Some TV crews were there (though less than what I remember from 2009). However, the number of photographers in the parade was very high - in some places, the colurfully dressed or flamboyant Pride participants were completely surrounded by photographers! 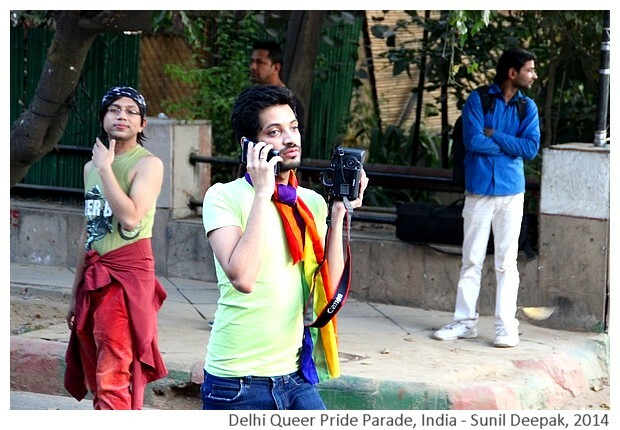 The last picture of this photo-essay is a homage to the Pride parade photographers! 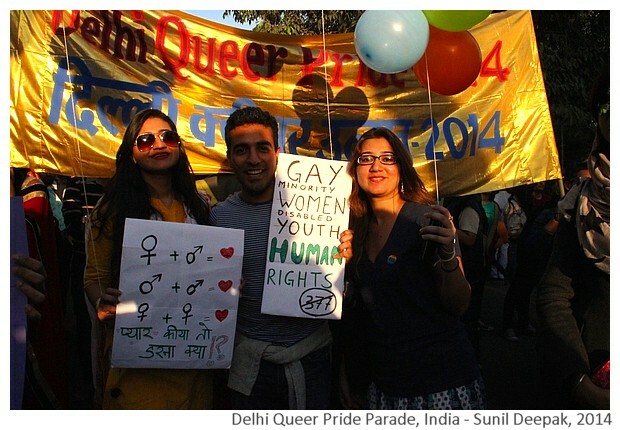 Finally, you can also see some more pictures from the Delhi Queer Parade 2014 in a photo-album on my Facebook page.